The Government have introduced two measures to make it easy for parents and teachers to see how well their children and classes are doing compared to other children their age. These measures are called Attainment 8 which measures what children have achieved and Progress 8 which measures how much progress they have made since KS2. For Attainment 8 students’ grades are compared with those achieved by children of similar ability at all the other schools in the country. As well as showing how successful students have been compared to others of similar ability, it also shows how effective the school is as it would be expected that students of similar ability would achieve similar grades. A student’s individual P8 score is not disclosed to their future employers or further education providers. It is data which is only used by staff at The Sydney Russell School and the Government to assess the effectiveness of teaching at the school. When students arrive in Year 7, their KS2 SATs results are used to estimate what their Attainment 8 Score (A8) should be in Year 11. This means that all students nationally who attain the same KS2 score will have the same estimated A8 score. 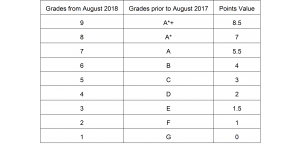 In Summer 2017, students taking GCSE English Language, English Literature and Mathematics were graded 9-1 but A*-G in all other subjects. From Summer 2018 all subjects will be graded 9-1. This will mean that students who received their results in August 2017 had both numerical and alphabetical grades but students receiving their results from August 2018 onwards will have numerical grades in all subjects. A Grade 4 in English and Mathematics is considered a pass and Grade 5 is considered a strong pass. Progress 8 measures the academic progress students have made since Year 7. To calculate a student’s P8 score at the end of Year 11, we subtract their estimated A8 score from their actual A8 score and divide by 10. If the end figure is higher than 0, then the student has done better than their peers. If it is lower than 0, they have not performed as well as their peers. It is important to remember that students are only being compared against those of similar ability. The A8 score is calculated using the student’s best 8 subjects from three buckets. If a student gets a higher grade for English Language or English Literature, the higher grade is double weighted in the English slot and the lower grade counts in the ‘open’ element bucket. Consider the following example which shows how this would work. Student A in Year 11 achieves the following nine GCSE qualifications when they leave The Sydney Russell School. Geography B, Art D, French C, Design Technology B. Notice that despite Student A achieving nine GCSEs, their Art GCSE has not been allocated in to a Bucket. This is because, subject to the criteria of the Bucket, P8 only takes the best 8 subjects and here Student A has scored higher in English Literature than they have in Art. We then subtract the estimated A8 score which in the case of Student A was 45.5. This gives us a score of 9.5, which we then divide by 10, to give a P8 score of +0.95. So, Student A, has achieved +0.95 of a grade better than students of similar ability at others schools. To calculate the school’s P8 score, we add up all the individual P8 scores and divide by the number of students who are in Year 11. At The Sydney Russell School, students will be required to have achieved at least Grade 4 in English Language and Mathematics and three other subjects to be accepted into Year 12. Individual departments may set additional entry requirements.